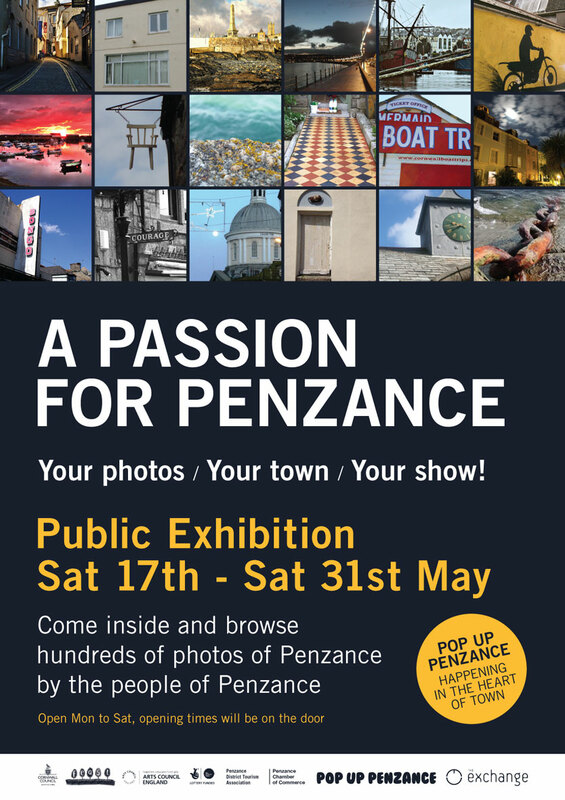 Penzance Chamber of Commerce: Pop Up Penzance - Photo Exhibition 17 - 31 May. Pop Up Penzance - Photo Exhibition 17 - 31 May. 'Pop Up' HQ (ex-Stead & Simpson shop) will be exhibiting selected photos from public submissions to its "A Passion for Penzance" programme. The photos capture peoples private passions for Penzance in all of its quirkiness. The exhibition will run from Sat 17 May until Sat 31 May. The deadline for entries closed on 4 May. Pop Up Penzance needs volunteers to invigilate the exhibition and especially in the first week (17th - 24th) because the Pop Up people are running the Pop Up Pirate shop in Peasgoods for the first week (yes Pirate Day is approaching fast). If you think you can help Pop Up Penzance for a morning or an afternoon then contact them and ensure you give them your mobile number. Penzance BID Survey - More responses needed!